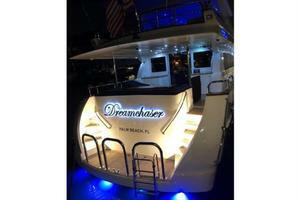 DREAMCHASER has a rich interior feel due to extensive Burl wood throughout with bookmatching and high gloss finish. 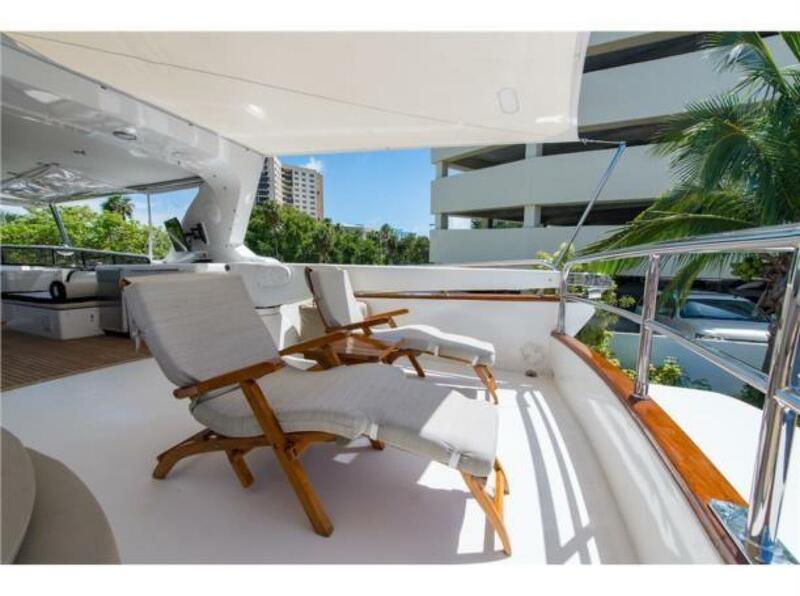 Originally constructed to be the builder "show model", combined with the current proud ownership and continual upgrading, this pristine yacht is a pleasure to tour. 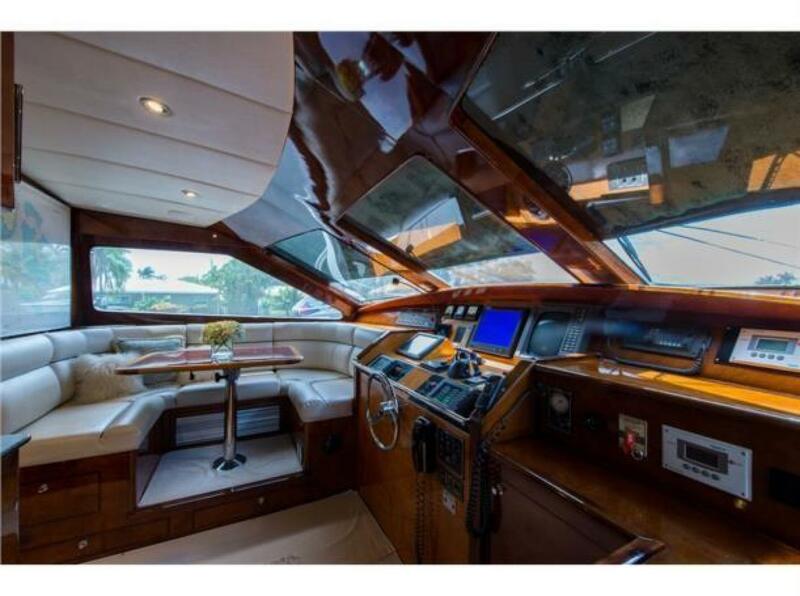 80' Supernova 2000, "DREAMCHASER"
A great opportunity to take over a yacht which has benefited from experienced owners who have improved DREAMCHASER throughout their ownership. 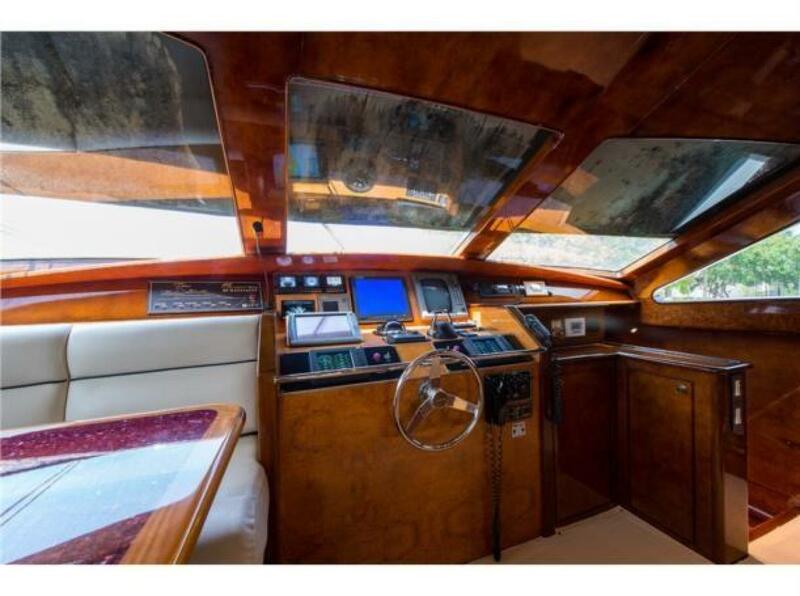 Clean boat that is ready for showing. 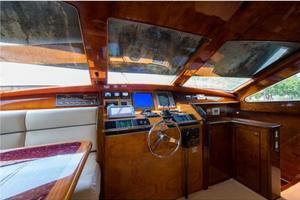 DREAMCHASER has a rich interior feel due to extensive Burl wood throughout with bookmatching and high gloss finish. 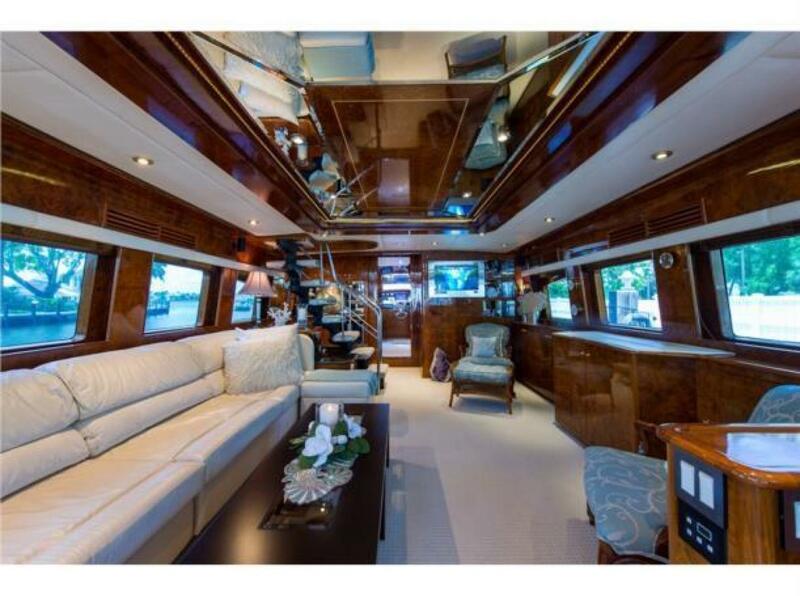 Originally constructed to be the builder "show model", combined with the current proud ownership and continual upgrading, this pristine yacht is a pleasure to tour. 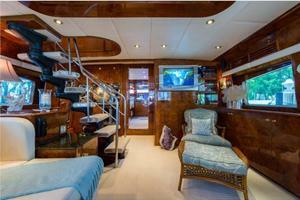 There are three king berth staterooms, each having a separate stairway down from the main deck. 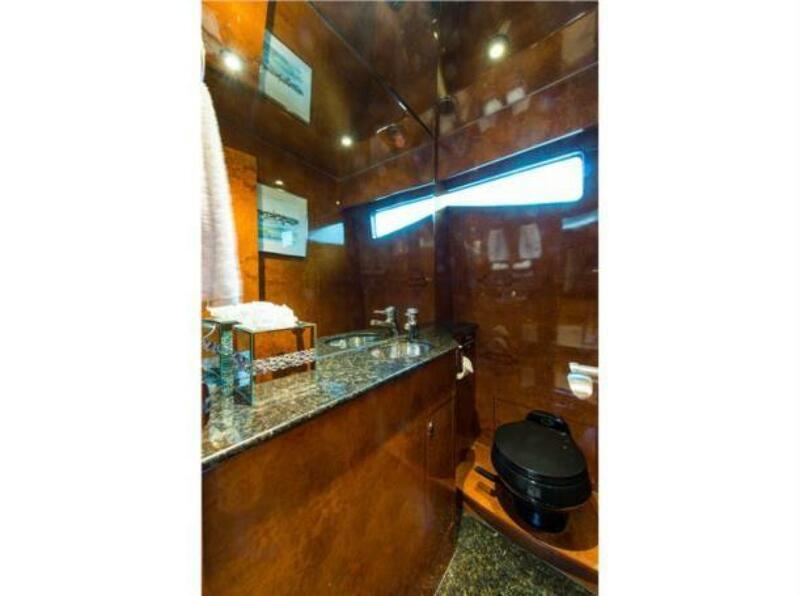 All have ensuite heads, two of which have bidets and Jacuzzi tubs, the forward stateroom head has a large shower. 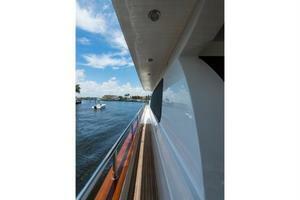 In addition there is a 4th guest cabin with upper and lower twin berths. On the main deck there is a day-head. 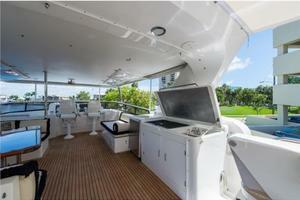 Completely separated and accessed from a foredeck hatch is a single berth crew quarter which has a head. sink, and air-conditioning. 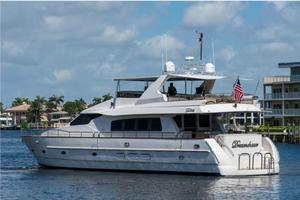 Some of her other features are full walk-around side decks, covered overhead from amidships aft. 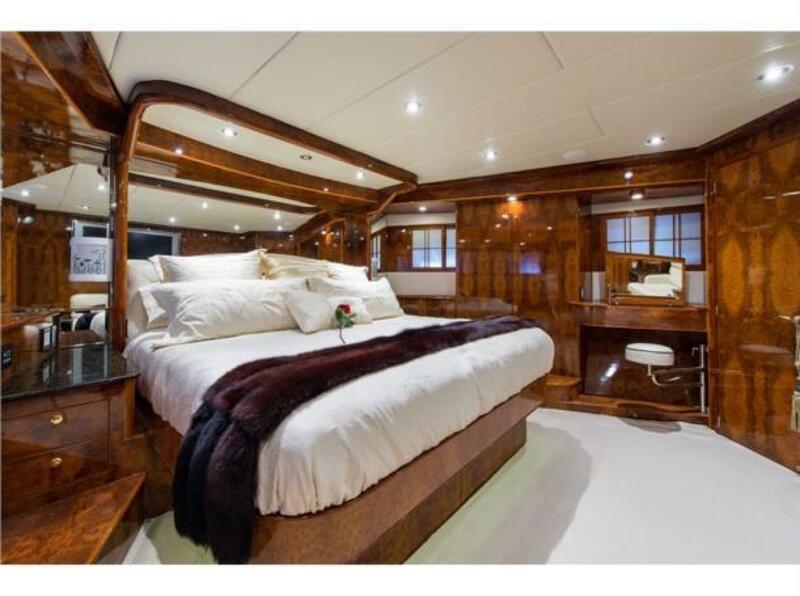 The bulwarks are topped with a thick teak, varnished cap rail with 2" polished stainless safety railings from bow to stern. 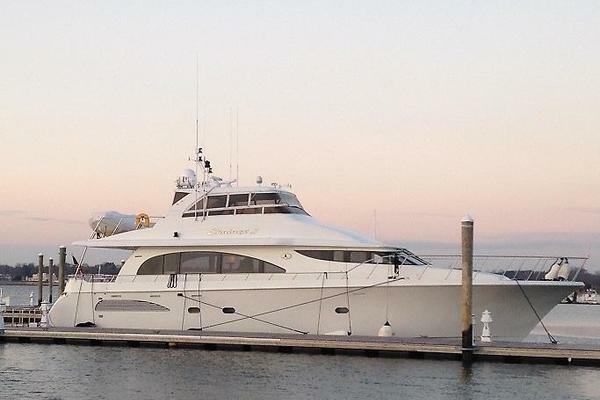 The entire boat was painted during a 2012 exterior refit that included the addition of a custom hardtop, new flybridge venturi windscreen, full bridge enclosure (poly panels with soft aft curtains), enlarged forward deckhouse windows, extension of the flybridge deck (providing coverage for the aft deck settee), and refreshing of the teak decking. 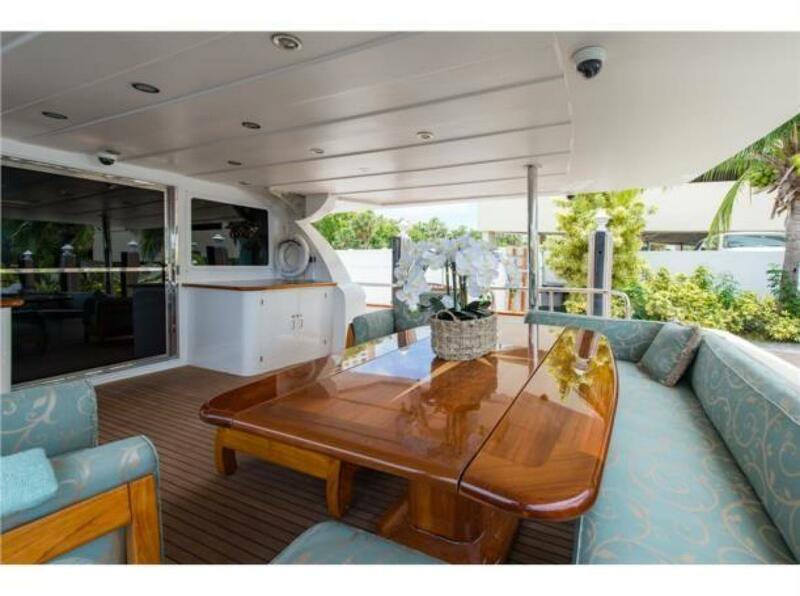 A large and open aft deck has a U-shaped, plush cushioned settee around a generous teak dining table with two fold up expanding leaves. Two teak cushioned chairs with an ottoman are just ahead of the table. Euro-styled curved stairways lead from either side down to the transom platform with stainless hoop railings. 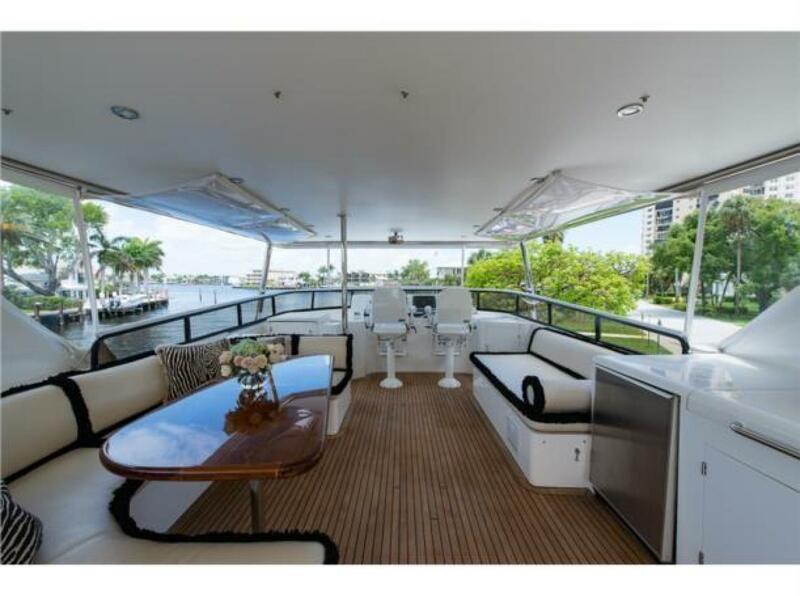 The flybridge is another highlight area with a large C-shaped settee and dining table to the portside. 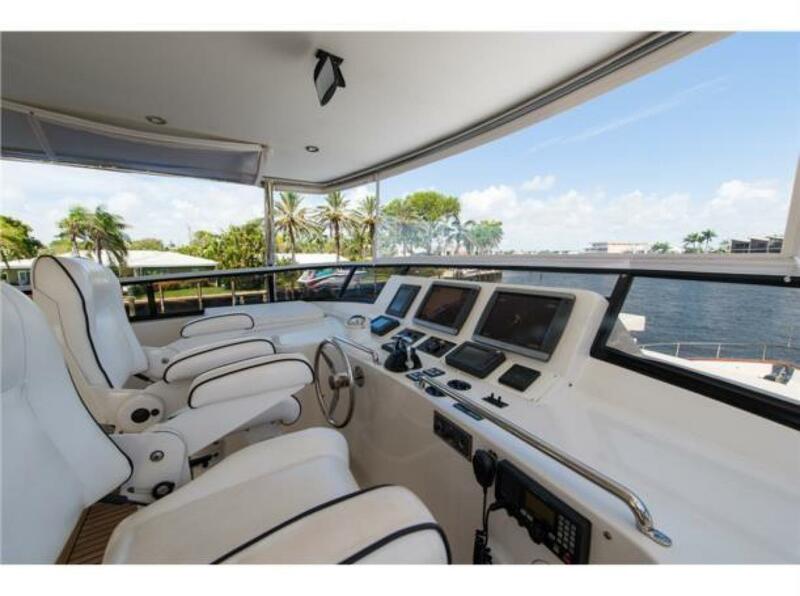 Forward is the helm console with twin Stidd helm chairs and to starboard is a nice lounge/couch followed aft by console containing refrigerator, sink, and Jenn-Aire grill. 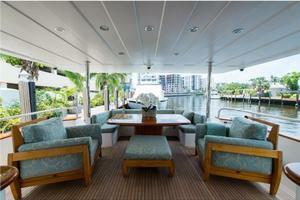 Above is mounted a flat-panel TV (HD sat dome and upgraded AV throughout the vessel). 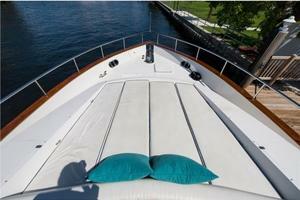 Further aft there are two teak steamer chaise lounges and a hot-tub shaded by a tailored tent canvas. 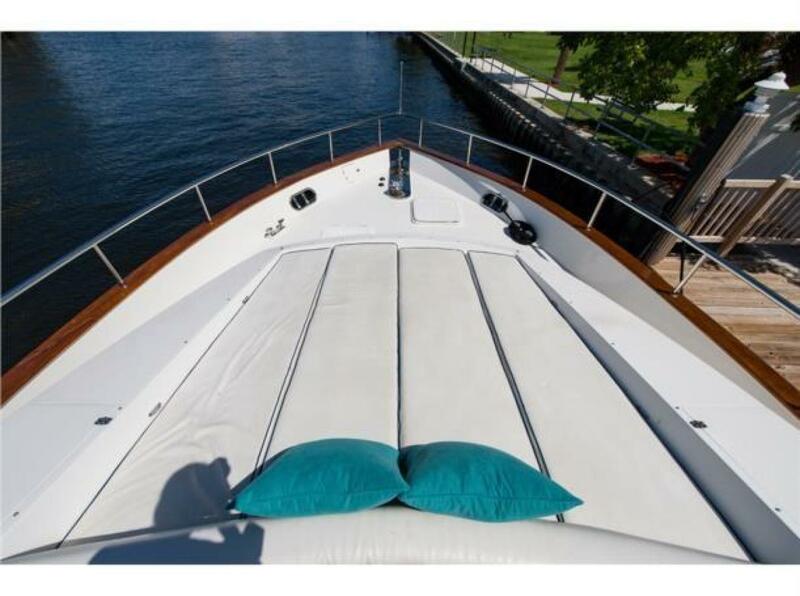 Out towards the bow is an oversized sun lounge cushion. 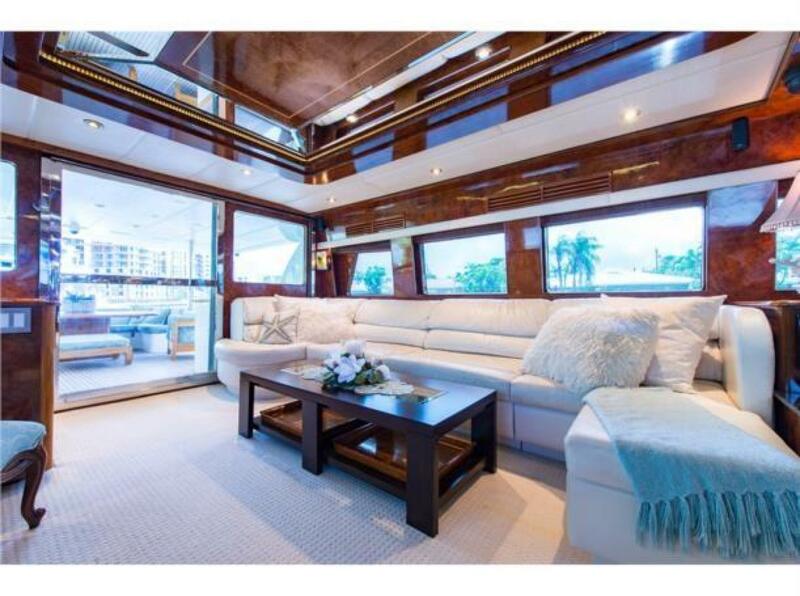 On the main deck the salon has a full sized leather couch to the portside with a dark wood and glass, rectangular cocktail table. 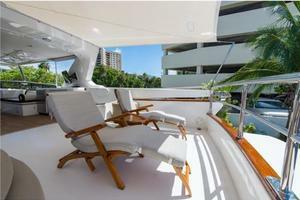 Across to starboard are two comfortable arm chairs, one with ottoman. Between the chairs a built-in cabinet houses a pop-up lift with large, curved HD TV. Forward to the portside is a floating stairway to the bridge and just beyond a teak and holly landing foyer for a side deck wing door. 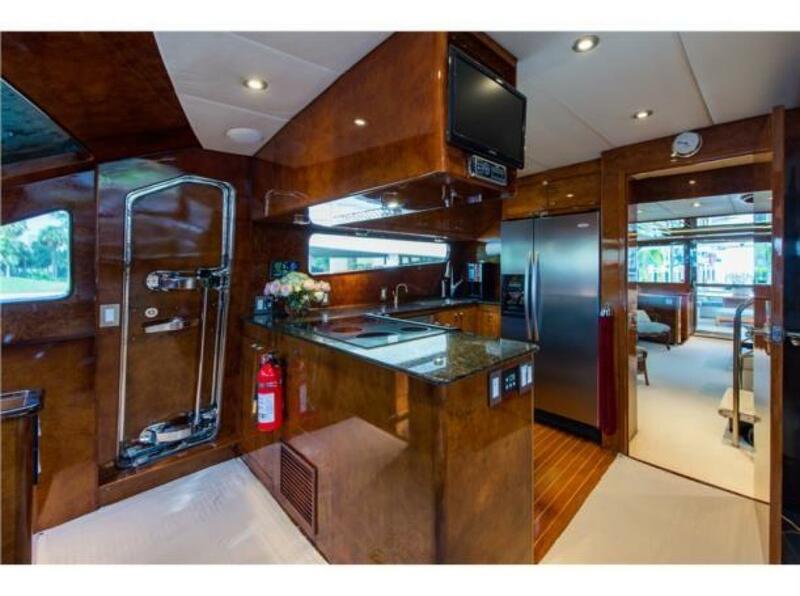 A mirrored alcove and granite counter is forward with two wine coolers just below. Here is also the top of the stairway down to the mid stateroom. Moving forward to the portside is the day-head. 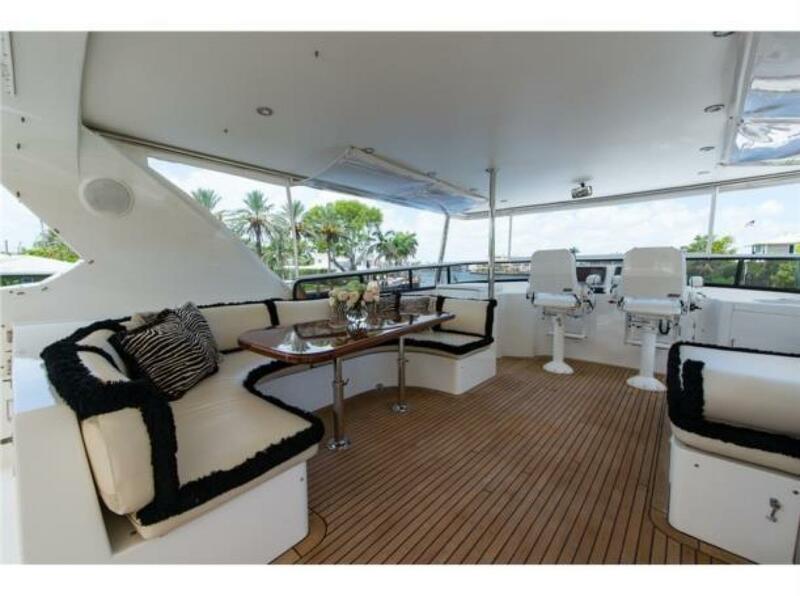 Next forward is a raised platform, C-shaped dinette that is conveniently next to the lower helm station. 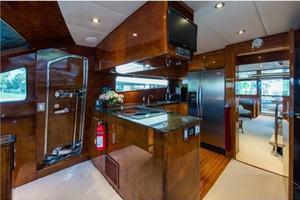 Just aft and across is the open galley with stainless front appliances and a Teak & Holly sole. Granite countertops and upper cabinets with lighting beneath. There is a door to close off this whole forward area from the salon if privacy is preferred. Just ahead of the galley to the side of the helm station is a pantagraph wing door providing easy access to the side deck and bow. Forward is the stairway to the bow stateroom. Although the layout preview is complete, there are many additional features which will be detailed in the following individual sections. 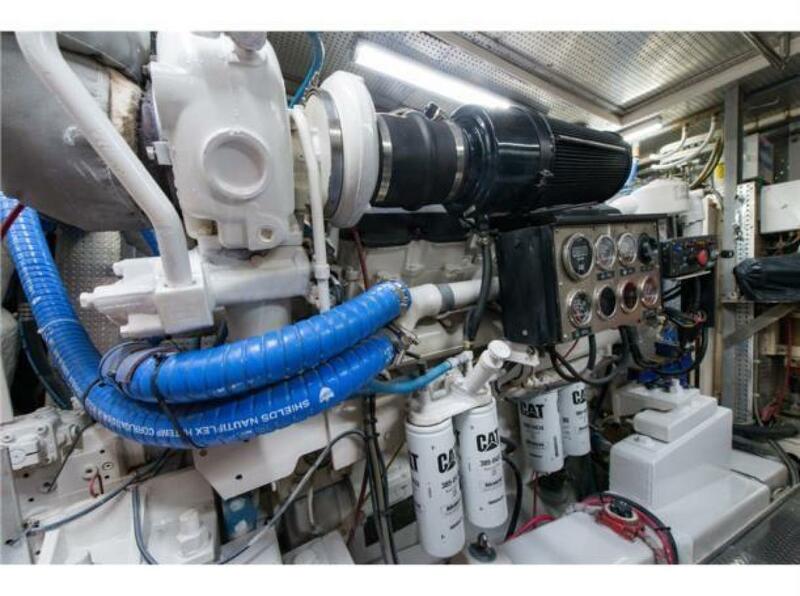 Some of those highlights: Bow & Stern Thrusters (3 stations), Naiad Stabilizers, KVH HD7 high-def Sat antenna & receivers, Extensive Inverter systems allowing generator free evenings with cabin Air Conditioning, AC and DC powered Watermakers, LED lighting throughout the vessel, Garmin electronics with separate Computer running Nobeltec Deluxe software / new Autopilot / new Color CAT engine displays, SeaBlaze multi-color underwater lights and more. 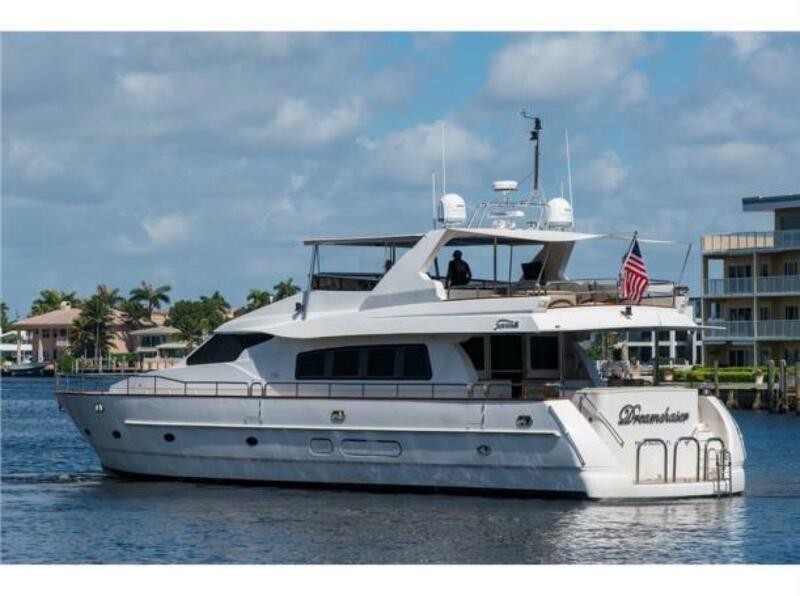 Customization of the exterior was completed in 2012, including enlarged deckhouse windows, extending of the flybridge aft, custom hardtop, and complete waterline up paint. 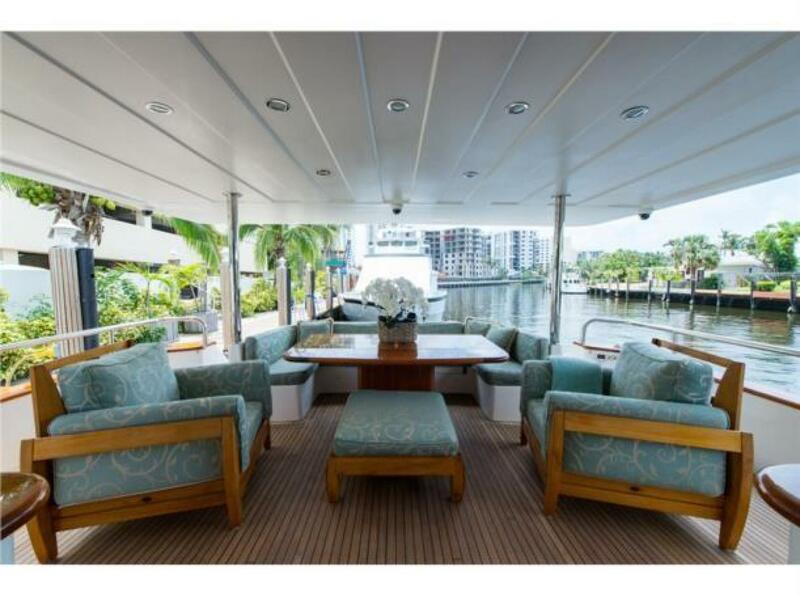 A spacious, comfortable area with teak decking and overstuffed, cushioned seating upholstered in a soft green regal pattern with two large teak chairs and an ottoman. The gloss teak table has an inlay compass rose on it with an actual brass compass embedded in the center with glass cover (unique!). This table has storage beneath in the base and 2 fold-up edge leafs. Comfortably seats 6, but 8 could fit. 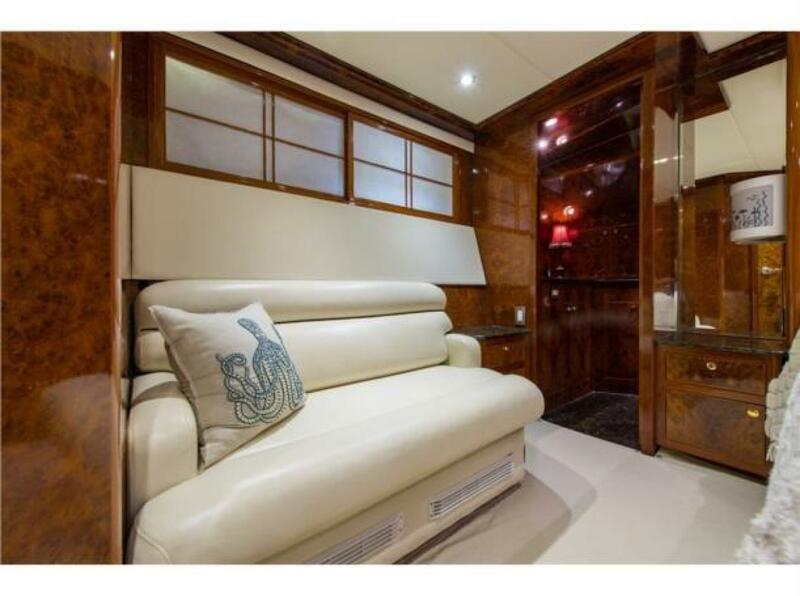 There is LED overhead lighting and a pair of flush mounted Bose speakers in the forward deckhouse wings and a Fusion stereo remote panel on by the starboard countertop. Also there are connections here for an additional TV and Sat receiver if desired. Boarding entry gates are from either side with attachments for the Marquipt boarding ladders. For entry from the transom platform there are curved stairways with handrails coming up either side of the settee. To the portside aft are the shore power connections with two Cablemaster outlets. Forward to either side of the centerline sliding salon door are banquet countertops gloss coated with teak bullnose and burgundy quartz tops. 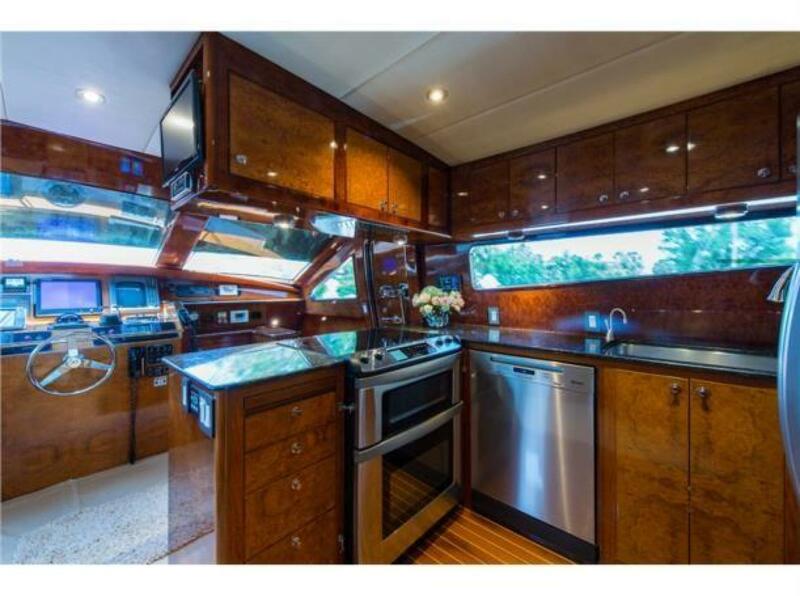 Beneath these counters in cabinets to port are two Premium stainless front free standing storage freezers and to starboard are storage cabinets. The main salon has primary entry from the aft deck sliding stainless and glass door. 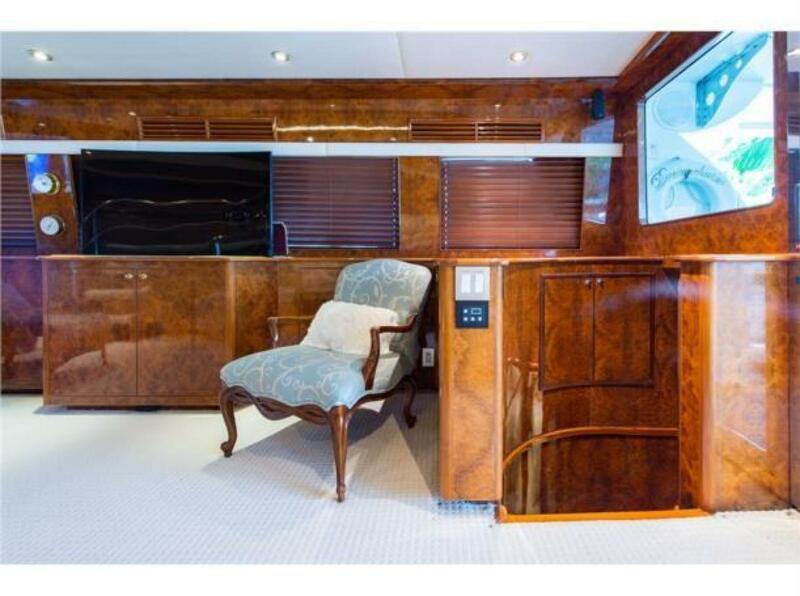 The beautiful burl wood is finished in high gloss, which is throughout the interior, exudes elegance without overpowering. Tight pile, light natural toned carpeting is tailor fitted with tan canvas floor runners. Large deckhouse window offer great views or the matched color wood blinds can provide privacy. 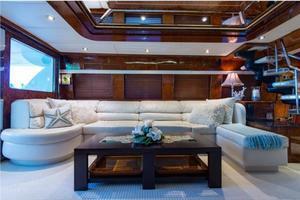 A portside free-standing, off-white leather sofa with plush décor pillows invites relaxation. 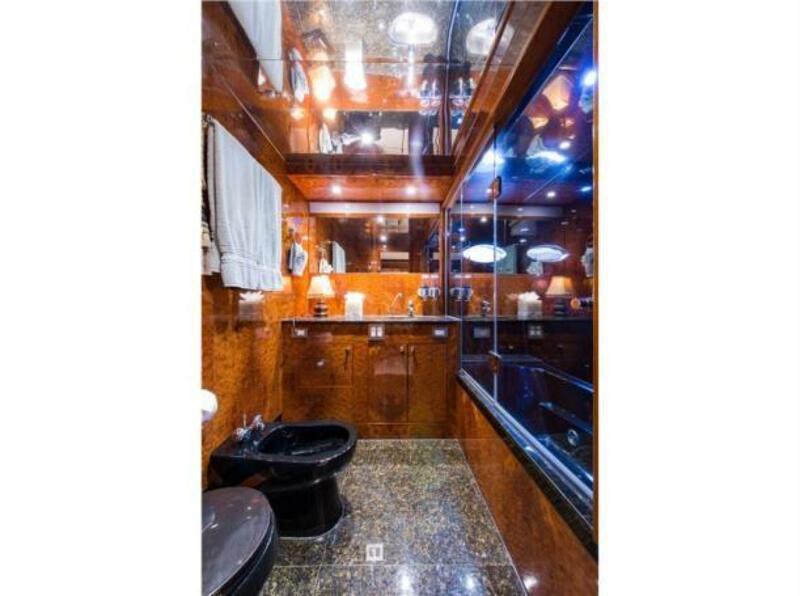 The ceiling has a overhead wood and lighted mirror inlay feature with attractive LED lighting. Between chairs cabinet housing Hi-Low pop up 55' Samsung curved HD TV - next cabinet aft has slide out A/V component storage, Bose system, KVH controller, Samsung BlueRay player, Direct TV TiVo, Fusion Stereo, etc. All appliances have brushed stainless steel faces and countertops are granite. The galley sole is Teak and Holly. Dinette: At the inboard end of the galley overhead cabinet is mounted a Samsung flat-panel TV (for viewing from the dinette) with a SAT receiver inside the cabinet. 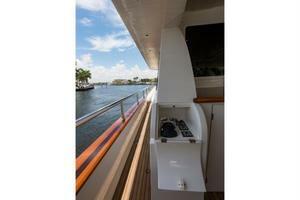 Just below is a Jensen 12v stereo which has overhead speakers in this pilothouse area. The C-shaped cushions of the dinette are off-white majilite faux leather with black piping, accented with decorator throw pillows. 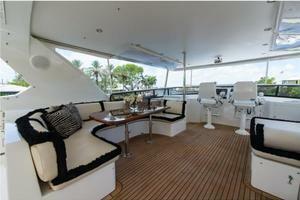 Hung on the wall behind the dinette is a large chart of the Bahamas. The table of the dinette on a polished chrome stanchion is high gloss, teak edged, burgundy quartz acrylic finished. 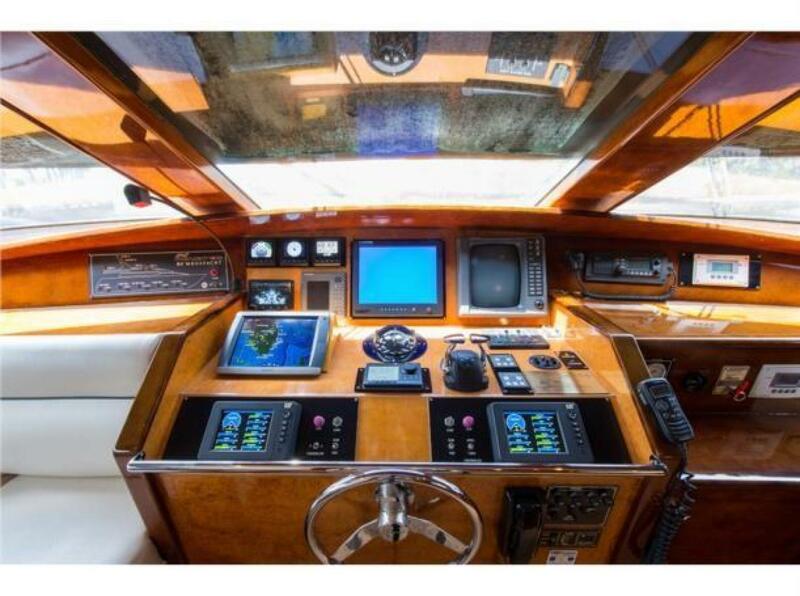 Outboard is a enlarged picture window and the entire seating area is on a raised (approx.8") platform with drawer storage (charts, placemats) beneath. Samsung flat panel TV on galley cabinet, facing dinette, 20"
Teak Decking beneath the Custom hardtop which has integral LED lighting. The Enclosure is three sides poly-carbonate panels which are track fastened to the windscreen, hardtop, radar arch and have opening panels. The rear side of the enclosure fastened to the aft of the radar arch is soft isinglass panels that can be rolled up or easily removed. 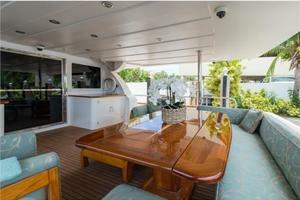 Aft of the entry hatch on the portside is a comfortable dinette settee with large gloss teak adjustable dining table. 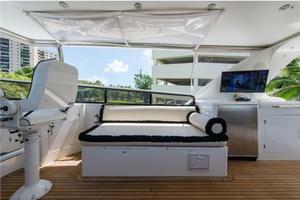 Across behind the helm starboard is a comfortable lounge/daybed with circular pillow cushion. 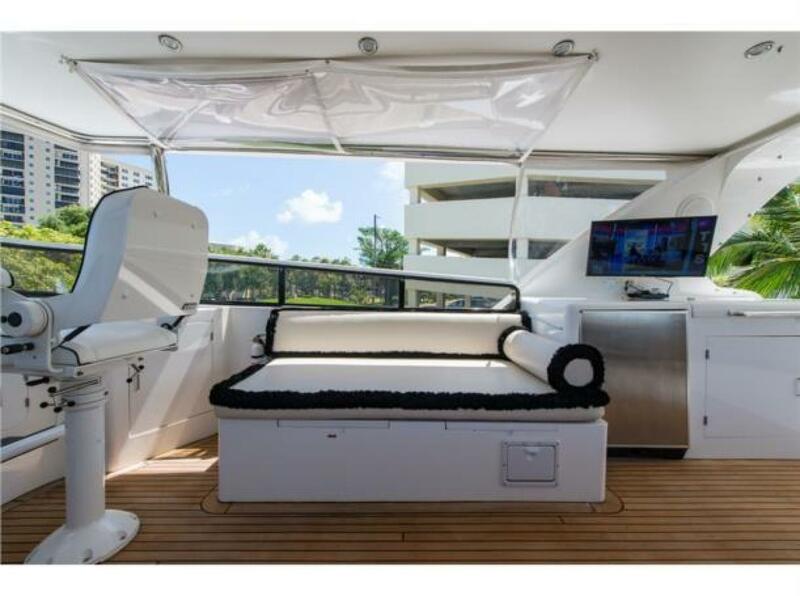 All the built in seating has custom cushions with white textured vinyl and fluffy black decorative piping, plus there are custom zebra patterned décor pillows. Storage beneath the lounge with life jacket packages. Also below is a fresh water Scandvik spray hose with hot/cold faucet. Starboard side aft beneath the radar arch is a fiberglass console housing a stainless front U-Line refrigerator with icemaker, Jenn-Aire grill, and stainless sink. Above is a 32' Flat Panel TV on adjustable swing mounting (with Direct TV box). Storage beneath the dinette seating is accessed from a door aft of the seating console. Above on top of the radar arch is a stainless signal light/flag mast and on the arch are matching SAT domes. 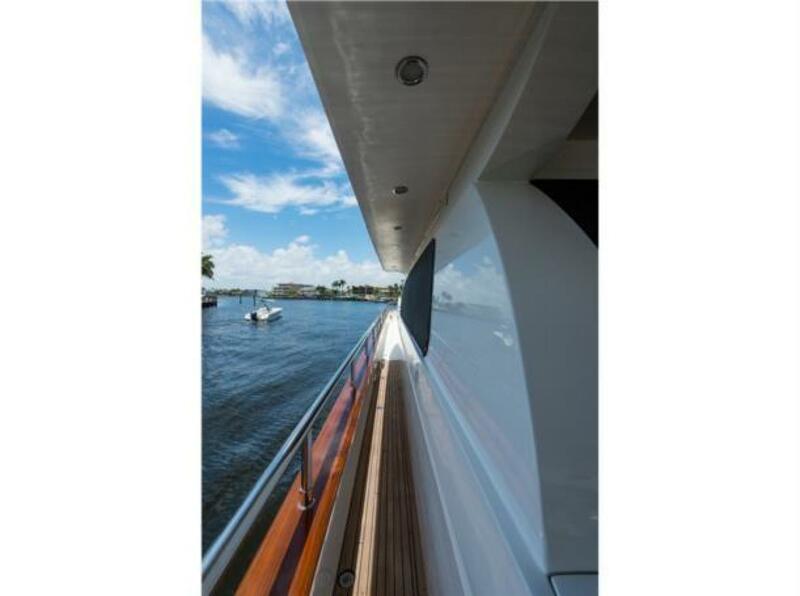 Aft of the radar arch is a tracked canvas shade that secures to two stainless insert poles covering this afterdeck area - this shade can be strap secured to allow use while cruising. 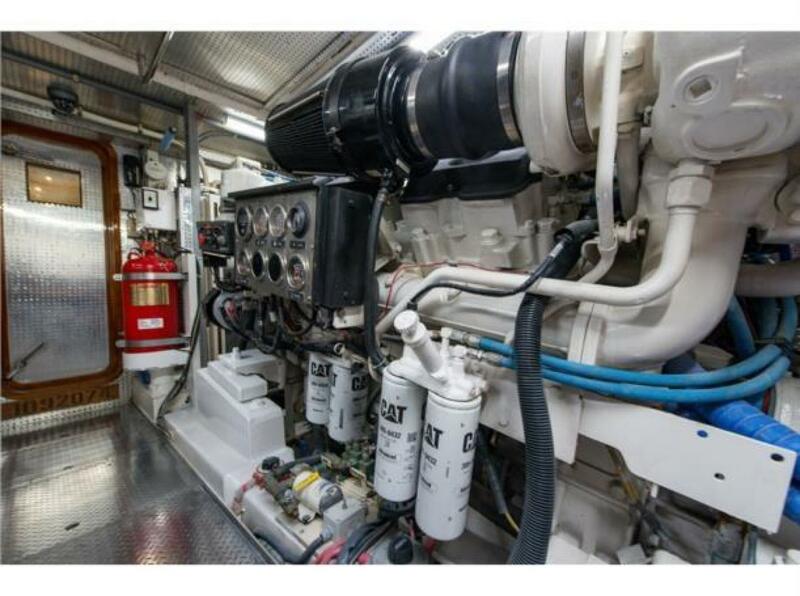 The deck is non-skid beyond the hardtop and like the side decks below there is a varnished teak cap rail with stainless safety railings around the perimeter, plus a stainless flag mast aft and stern running light housing. Two teak Queen Ann steamer lounge chaise chairs with fitted cushions and teak slat table. 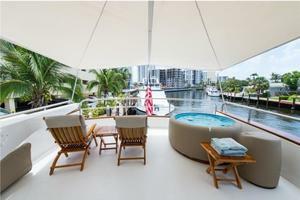 To the portside is a 2-3 person Soft-Tub free standing spa with cover and heater/motor. To the outboard starboard side is a davit with extendable boom (1500#?). There are three stairways down to the lower deck, each having one large king sized, full beam stateroom and ensuite head. The mid stairway has a small landing with doorway to the mid king stateroom, as well as an entry door to the 4th guest stateroom. 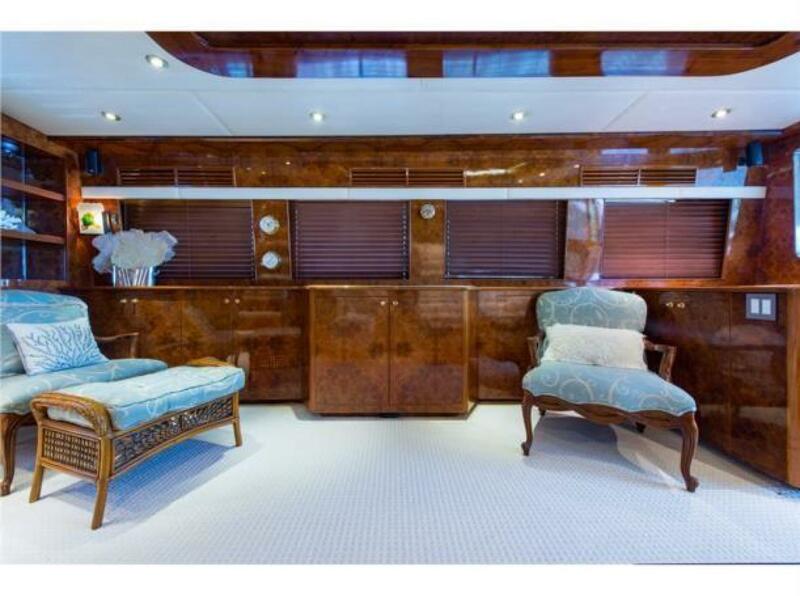 All staterooms have the same rich, book matched burl as the main deck and are smartly carpeted with plush, neutral toned, short-pile. 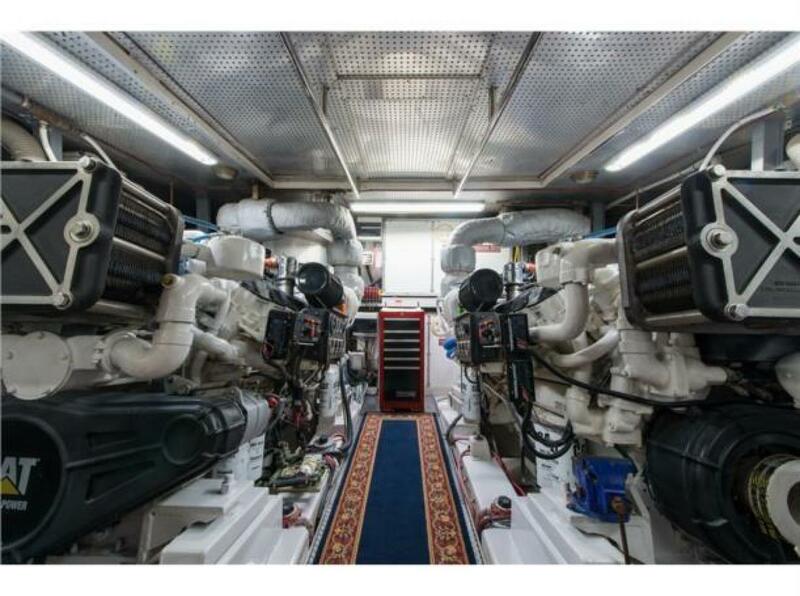 The three king staterooms all have multiple climate control systems, which accommodates air-conditioning on evenings even when on anchor without generator running (110v by inverters). 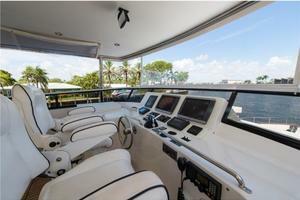 Each has it's own Flat panel TV/ Direct TV receiver / Blu-Ray or DVD player, and stereo system. 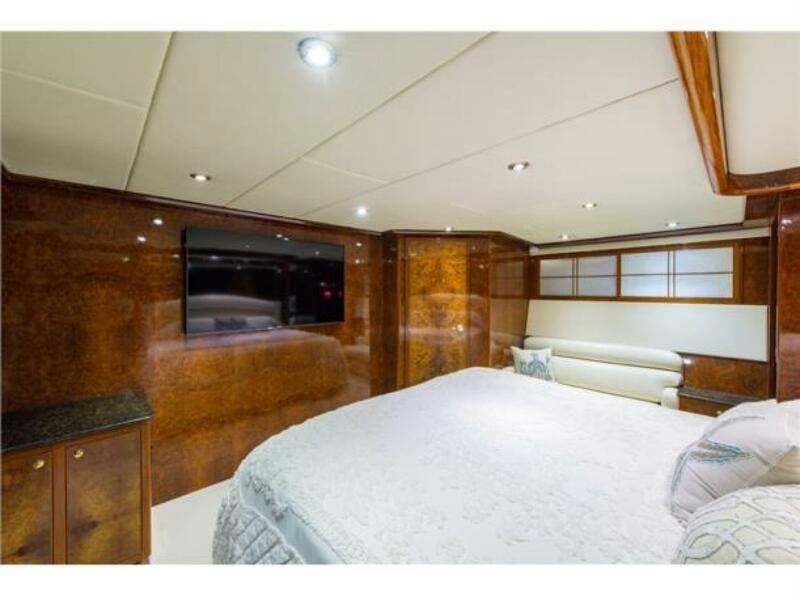 Berths all have tasteful linens and padded headboards, granite topped end tables to either side of the bed with decorative sconce lights above. All the heads have fresh-water Vacu-Flush toilets, glass bath enclosures, and stainless steel undermounted sinks with chrome plumbing fixtures. 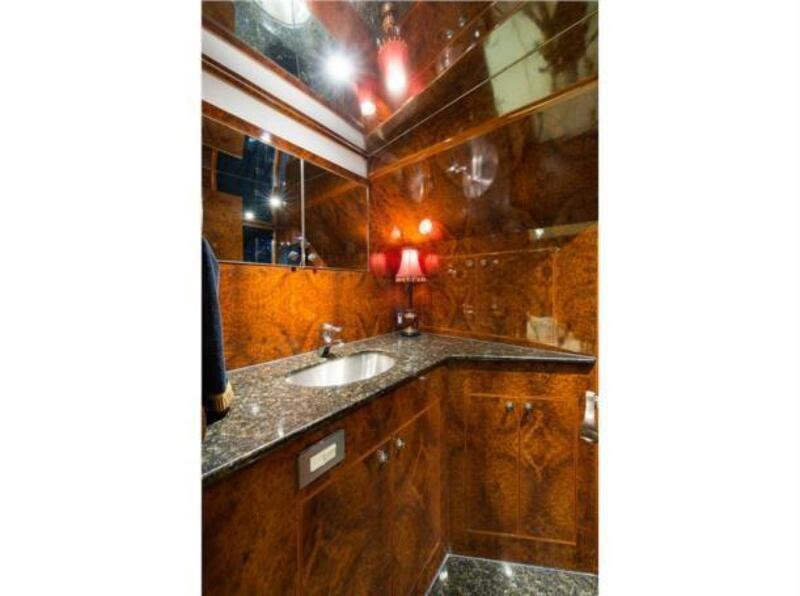 They also all have granite vanity tops and floors with large mirrors. The mid and aft stateroom heads have bidets and Jacuzzi tubs, also with shower wand fixtures. Stairway is from the right of the lower helm station and leads down to the stateroom with walk-around king berth forward, centerline. To either side of the stateroom the hull side portholes are framed with sliding Shoji screens and the effect is attractive. 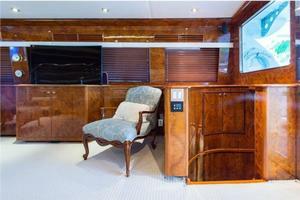 Starboard side also has a swing out stool with desktop that opens to a make-up mirror. 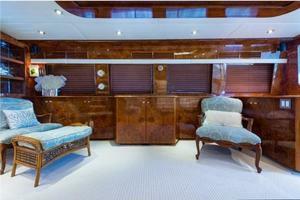 The aft wall of this stateroom has a love seat couch with end tables to either side. Just above wall mounted is a 46" flat panel HD TV. 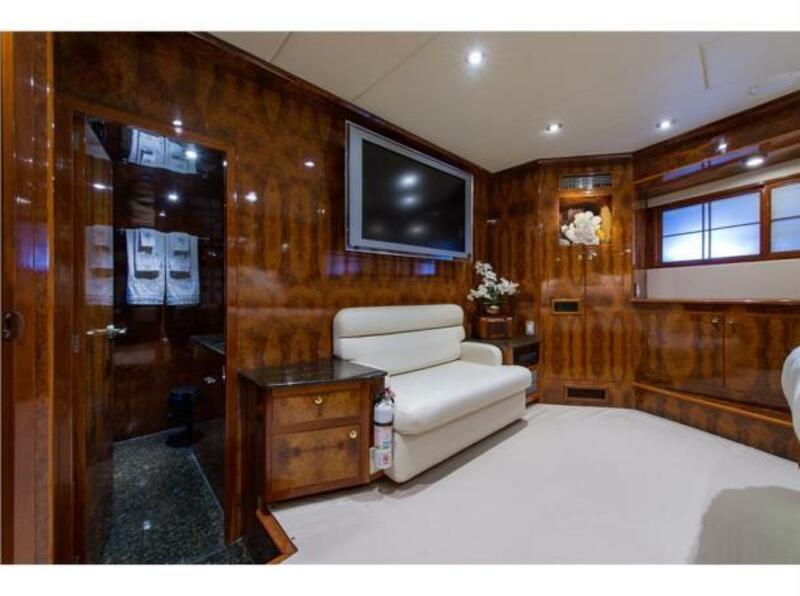 The aft port corner has a lighted display alcove with decorative items. 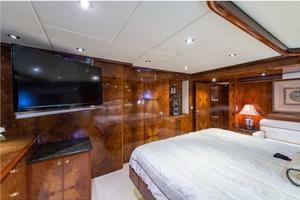 Aft to starboard is the entrance to the ensuite head finished with granite, stainless, and mirrors. This head has a large stall shower. Stairway is from the forward portside of the salon and leads down to the stateroom entrance aft. 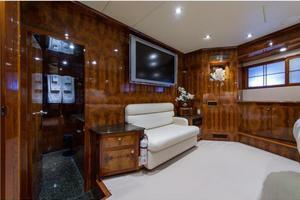 The walk-around king berth centered off the portside and immediately notable is the generous floor space in this room. In this stateroom the Shoji screens are to either side behind the berth and resulting light effect is notable. 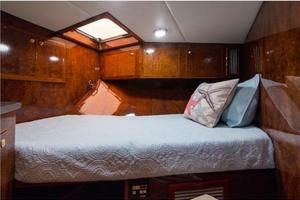 Forward side of this stateroom has a closet, built in dresser and cabinet. Above to the starboard corner is an adjustable mount supporting a 55" flat panel HD TV. Next aft is the ensuite head with the vanity to the outboard end, beautifully detailed vanity with small decor lamp to the side. 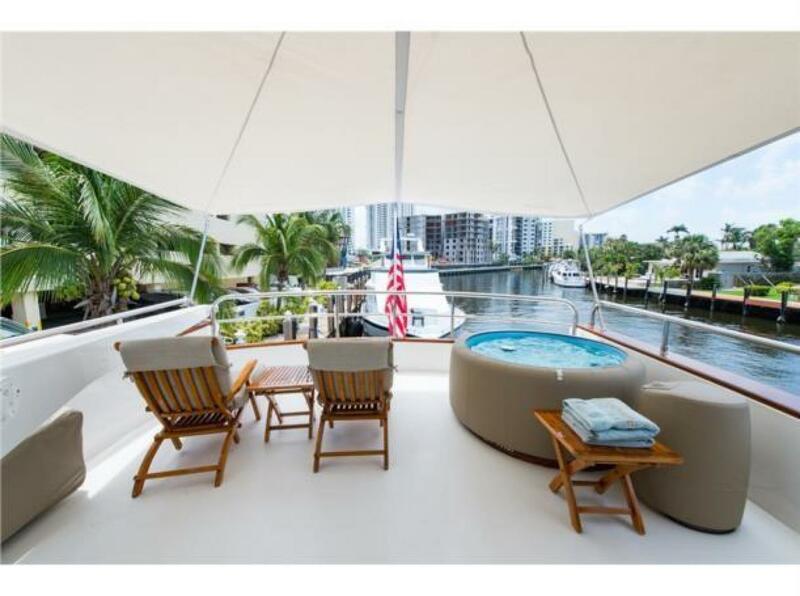 The glass enclosed Jacuzzi is aft. 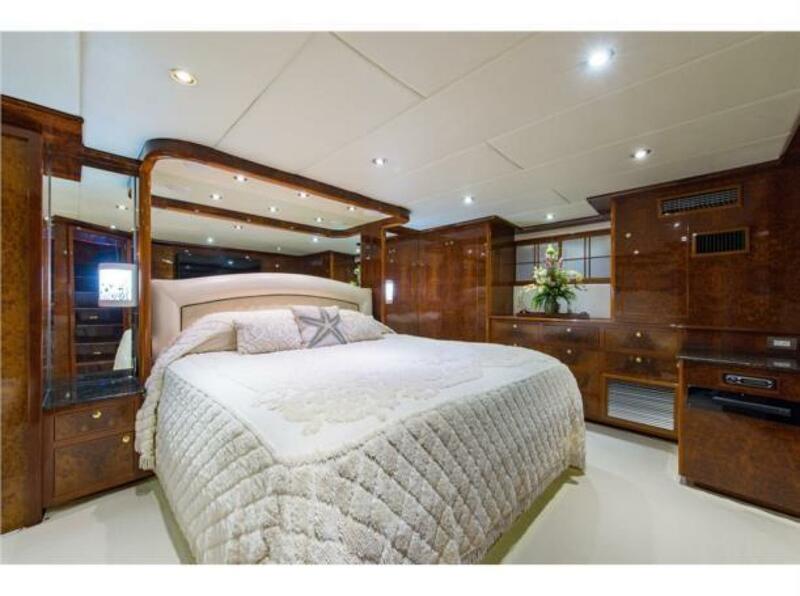 To the forward side of this stateroom is a couch with framed artwork above and granite topped end table to one side with an attractive table lamp. Just past this couch is a hanging clothes closet. 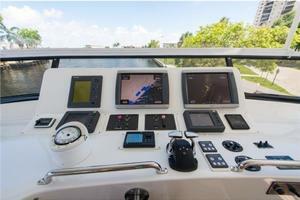 On a mount above the aft bed nightstand is a 8" Garmin color multi function display that can give all vessel info. To the left of the entry door is a lighted alcove with a bronze artwork sculpture. 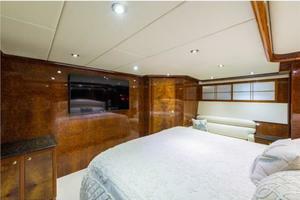 This is currently used as the Master Stateroom. Stairway is from the aft starboard corner of the salon curving to the right and leads down to a landing area where there is a cabinet housing the primary electrical switching panels followed by the entry door to the aft stateroom. 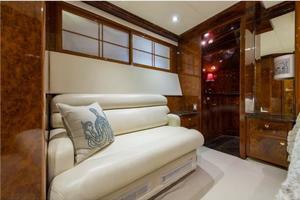 The walk-around king berth is positioned against the aft wall of the room. 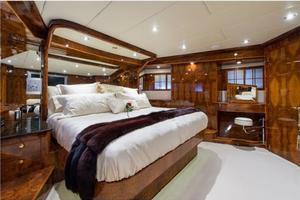 Neatly fitted with a textured design bedspread and decor pillows, owner's currently use this as the VIP Guest Stateroom. Mounted on the forward wall of the room is a 46" flat panel HDTV. To the portside are two hanging clothes closets and a built-in dresser between them with a floral arrangement on the countertop. Above are the sliding Shoji screens. 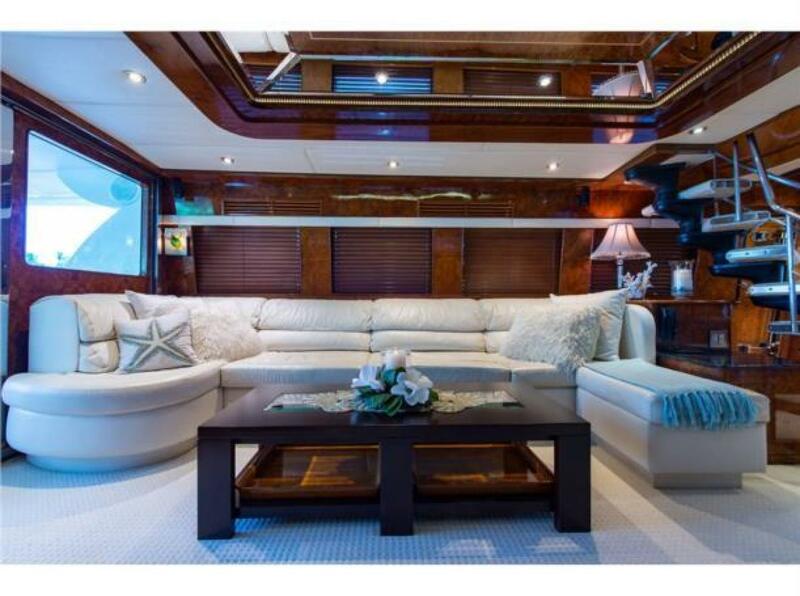 Opposite to the starboard side of the room is a love seat couch with granite top end table to the side and Shoji screens above. Next aft is the entrance to the head with L-shaped vanity to the left with a small decorator lamp in the corner. 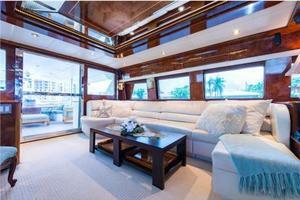 The glass enclosure and Jacuzzi are across to the portside. 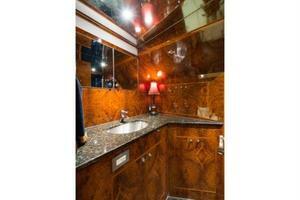 This stateroom is accessed by the mid stairway and has twin upper/lower berths. If desired the upper bunk can be lowered to make this more of a lounge space. 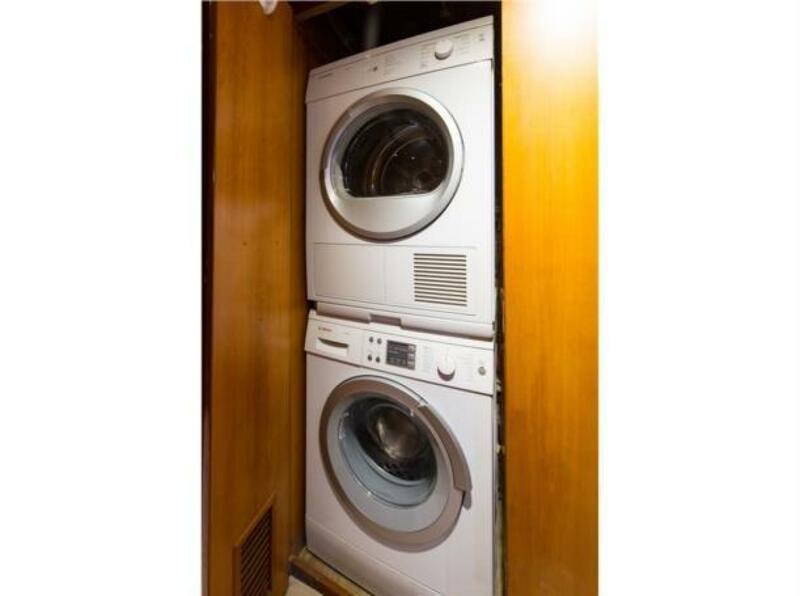 Inside the cabinet closest to the door are stacked but separate front-loading Miele clothes washer and Miele dryer. 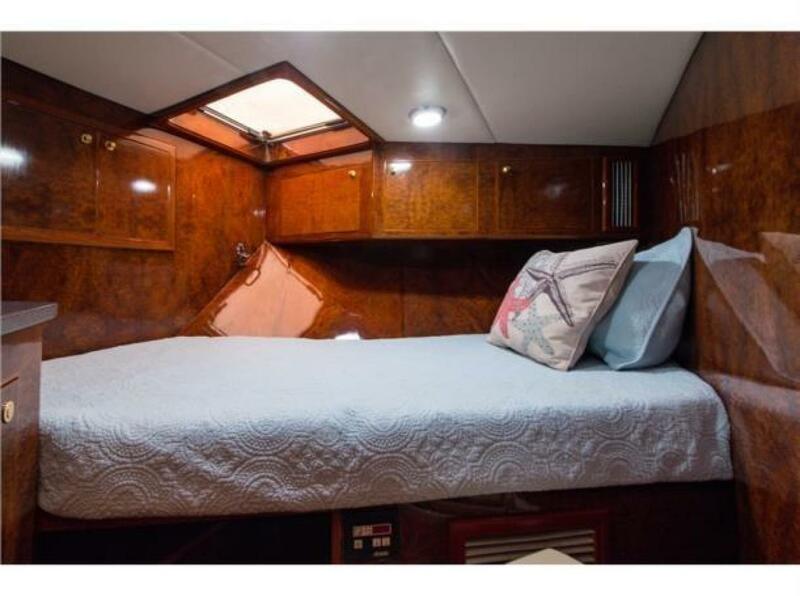 There are reading lights for either berth and the upper has the Shoji screen porthole treatments allowing natural lighting. There is a 32" flat panel HDTV on an adjustable mount which has it's own receiver and stereo. Also mounted here is a 4" Garmin GMI 20 display giving digital nav data/depth etc. 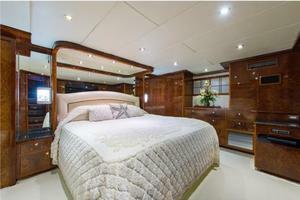 Completely separated from the other staterooms, access is from a hatch on the foredeck (there are two hatches). 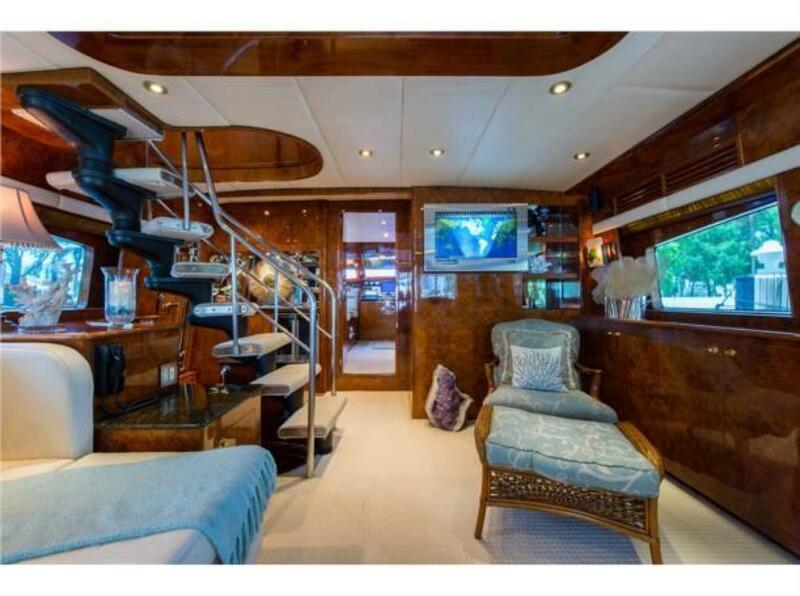 A couple of steps in there is a full sized berth with an independent air-conditioning unit. 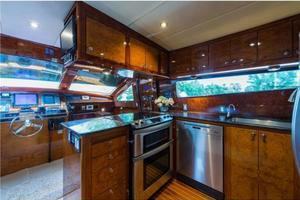 Also inside this cabin is a head, a sink with granite vanity top, cabinets, and drawers. 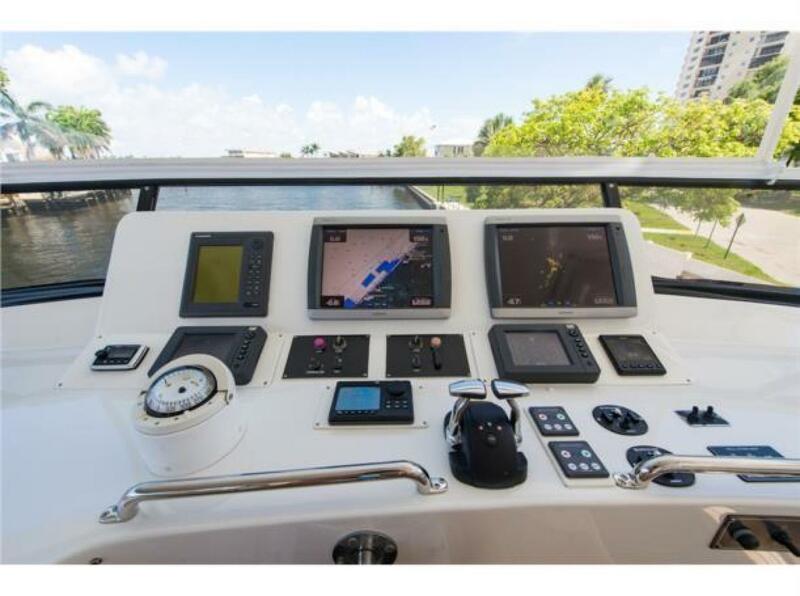 Ten black braided docklines, 1" and 1 1/8"
Inverter systems are capable of powering the entire 110v system of the yacht for up to 8 hours. 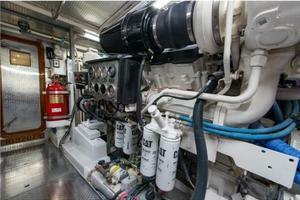 There are automatic starts for generators if desired. This vessel has three separate HVAC systems aboard. Primary ships system is 220v consisting of 7 units totaling 152,000 BTUs. 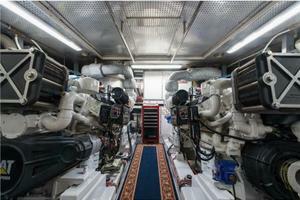 These units are sea-water cooled by two large raw water pumps plumbed in tandem. 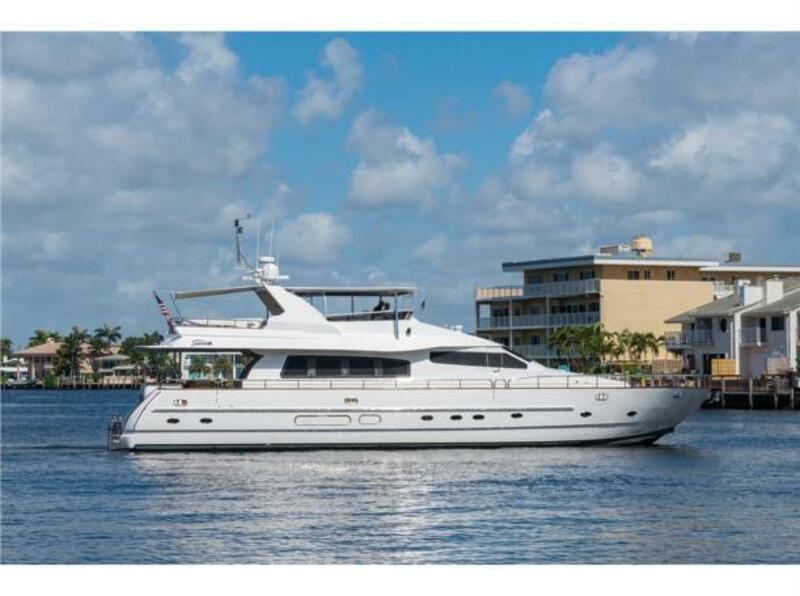 The 3 large staterooms all have independent 110v Air Conditioning systems capable of operating without shorepower or generator courtesy of this vessel's Inverter system. 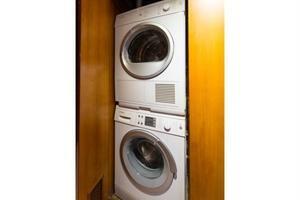 These units total an additional 24,000 BTUs. In the mid-stateroom there is a single 24v air-conditioner producing 10,000 BTUs. 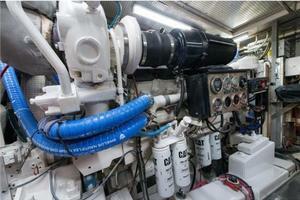 These two systems are not seawater cooled. 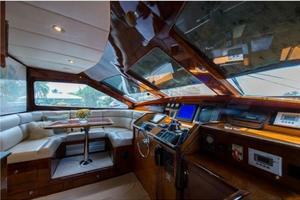 In 2012 an extensive exterior refit was accomplished including complete Awlcraft 2000 paint from waterline up. 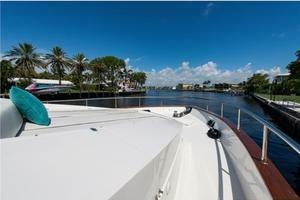 The flybridge windscreen was replaced with a new venturi styled unit and a custom hardtop was fabricated and installed. 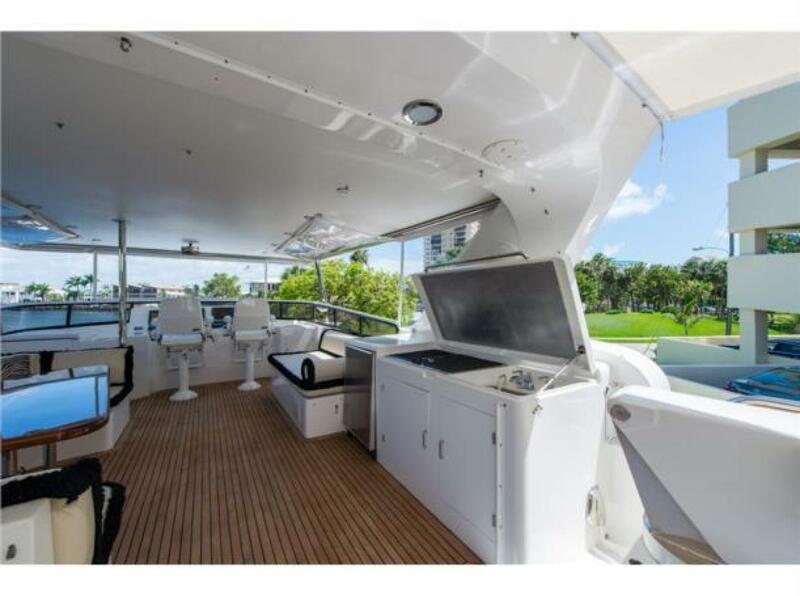 The rear of the flybridge had an extension created so the overhang would cover the aft deck lounge. On the forward deckhouse the windows were enlarged and restyled from the original construction. 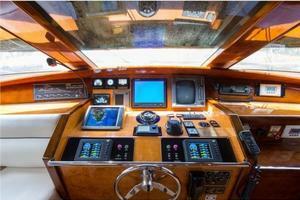 Since this time a fastidious owner has continually upgraded numerous systems throughout the boat. 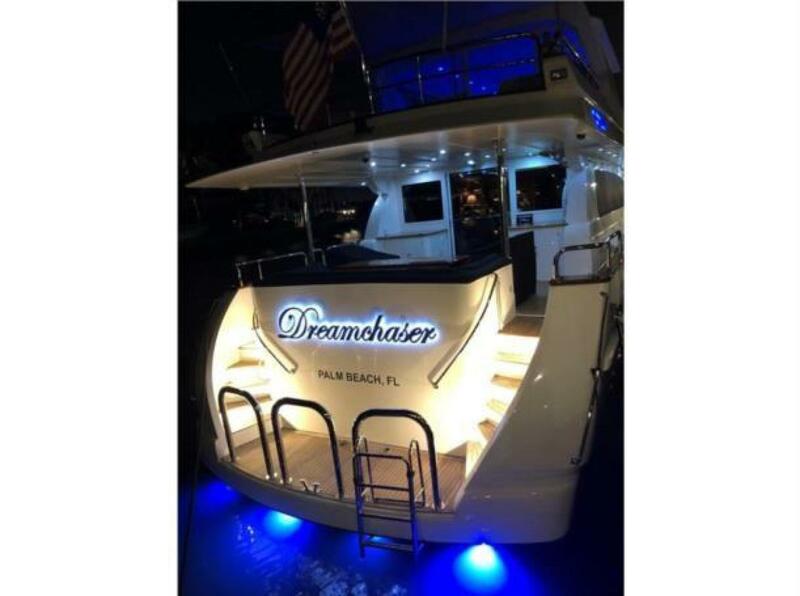 Exclusions: The DREAMCHASER is still in use by her owners and as result there are many personal items aboard that may be excluded from the sale. A complete list of exclusions will be provided upon request following seller's acceptance of offer. *Engine hours are as of the date of the original listing and are a representation of what the listing broker is told by the owner and/or actual reading of the engine hour meters. The broker cannot guarantee the true hours. It is the responsibility of the purchaser and/or his agent to verify engine hours, warranties implied or otherwise as well as all other representations noted on the listing brochure.